We aim to see @Steem.Ninja as one of the top service providers on STEEM Blockchain. Slowly improving and finding different ways to help you guys spread the word & get more options to earn. Stay tuned! Replace "yourusername" with your username. ;) Ninja Style. Download all the images and use them to spread the word. Each account automatically delegates 15 Steem Power to each new user for 90 days. Introductory Steem.Ninja post for more information! 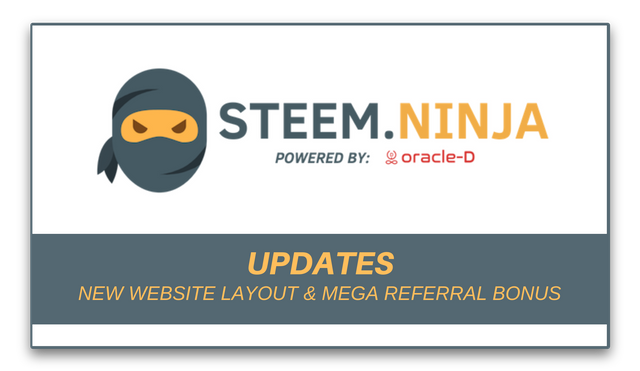 STEEM NINJA is powered by @Oracle-D.
What an amazing way to bring people into the steem blockchain. Getting paid for referring people would definitely make for more growth in the steem blockchain. Thumbs up guys. hi sir pls explane me clearly.. This service is one of the best on the steem blockchain. You can even earn by referring people. I will really appreciate the ability to buy STEEM directly with a credit card, I believe that will be a first! Congrats! Steem made easy with steem Ninja! Keep up the good works people. Resteemed! Wow.. @steem.ninja did the high movement. It will bring a lot of people in steem blockchain ecosystem who did not want to waste their time for waiting too long to get the steem account. It is good for onboarding people to steem ecosystem through steem.ninja. But why only credit card? I can understand through credit card you can represent a true person and identity to this ecosystem. But you must understand that for every country mostly Asian countries it is not that easy for everyone to have a credit card and make an international transaction. You can do the same through Skrill or Neteller and they are also quite close to the standard verification of an individual as not a single person can hold two ids of neteller or skrill and by allowing skrill or neteller you can onboard more people. I am saying this to you what people said to me when I talked about steem.ninja to them. I hope you understand this. Thank you. we plan to add more payment methods soon! Stay tuned. About 130.2$ has been spent to promote this content. I translated this article into Japanese. Arranged a little. Wow! I'm very interested about the option to buy STEEM with credit card. When is this on your roadmap? Excellent, another herculean task achieved. That's great efforts by you for steemit community. Good work. Great opportunity for all steem community thanks for sharing. Ilove this amazing development by @Oracle-d. 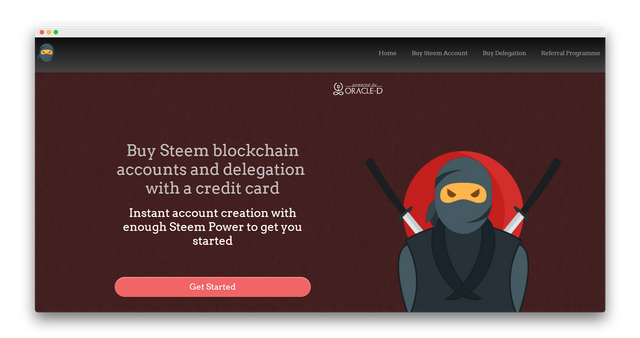 I have been perusing the @steem.ninja blog over a few days to see how I can support the project especially with promotion as well as with STEEM transactions with Debit card. This is a great innovation. I am very hopeful for instant purchase of Steem with USD credit card payments, as it would ease #steem investment. Such an amazing service provider on Steem blockchain I really love to use this simple user friendly interface. Thanks for this opportunity to reffer friends to create steemit account. Getting paid for referring people would definitely make for more growth in the steem blockchain. What is the maximum allowed on Steem.ninja for charging per account? I've checked your site out. I realize everyone got mad at Jerry for charging $50 per account, but I want to use your referral program to charge not just for an account but also for the business service I'll provide. hi sir pls explane me clearly. This post has received a 64.13 % upvote from @boomerang. @steemium purchased a 60.21% vote from @promobot on this post.